It's the platter I've heard so much about! Located near the Ang Mo Kio Community Library (next to Courts), is a stall in a coffeeshop that's got meat lovers going bonkers. My buddy Desmond was the one that asked if we could eat here based on an article he read. Considering it's $59.90 for the XXL Platter you see below, all of us said YES! The platter feeds 6 to 8 people so we each paid roughly $10 each. Freaking affordable right? It consisted of 6 meats & 10 hot sides/cold salads. 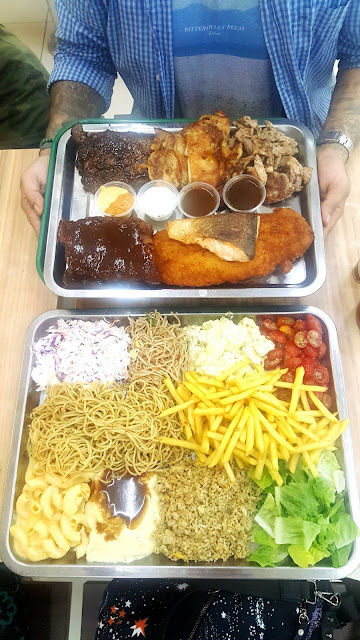 The meat...Ribeye steak, Half rack spice BBQ baby-back ribs, norwegian salmon, grilled cajun chicken, fried breaded fish & grilled garlic pork collar. The sides...mash potato, mac & cheese, shoestring fries, garlic fried rice, aglio olio and potato & egg salad, cherry tomatoes, tuna salad, coleslaw and romaine lettuce. How was the food? Damn bloody good! I highly recommend you pay them a visit. If you're having an office or house party, they have a party menu too! 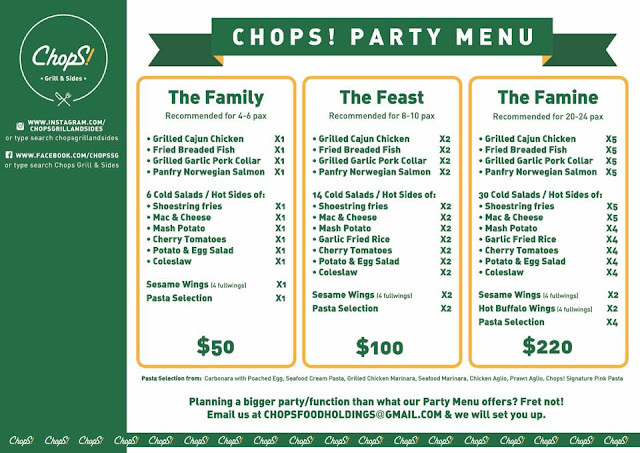 Chops Grill & Sides is open 7 days a week from 11am to 10pm @ 727 Ang Mo Kio Ave 6, Singapore 560727.